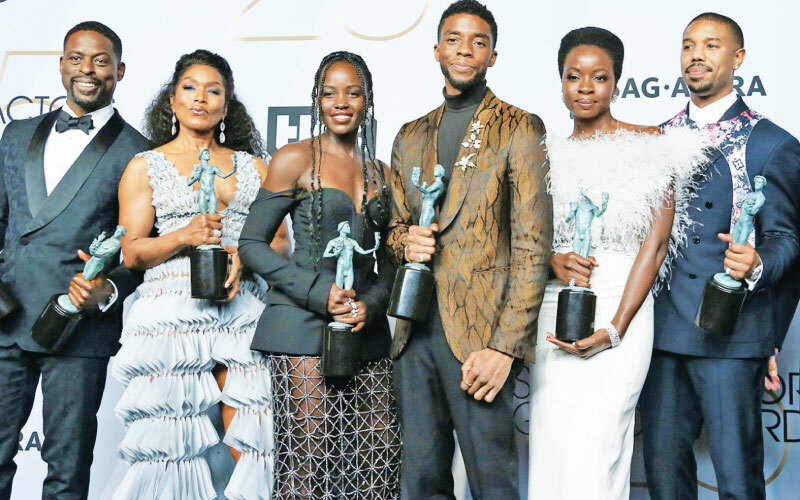 Black Panther has won the top film award in at the 25th Screen Actors Guild Awards in Los Angeles on Sunday, putting it in strong contention for an Oscars win this February. In a nomination pool that largely eschewed heavyweight Oscar contenders, ‘Black Panther’ beat ‘A Star is Born’, ‘Bohemian Rhapsody’, ‘Crazy Rich Asians’ and ‘BlacKkKlansman’ to receive the award for outstanding performance by a cast in a motion picture. It also took out the award for best stunt ensemble, announced prior to the awards telecast, which was hosted by Megan Mullally. Meanwhile, the best actor awards for film went to Glenn Close for ‘The Wife’ and Rami Malek for his performance as Queen frontman Freddie Mercury in ‘Bohemian Rhapsody’. The SAG Awards are generally considered one of the most reliable bellwethers of the Academy Awards, with best picture winners at the Oscars nearly always winning the corresponding SAG award earlier in the year. But two of this year’s leading Oscar nominees, ‘Roma’ and ‘The Favourite’, were bypassed in the main by the Actor’s Guild. While ‘The Favourite’ received SAG nominations for its leading female actors, ‘Roma’ was omitted entirely. Meanwhile, both films have landed a massive 10 Oscar nominations each. Emily Blunt won the award for best female actor in a supporting role in the motion picture section of the awards for her role in the horror film, ‘A Quiet Place’, beating Emma Stone and Rachel Weisz, whose performances in ‘The Favourite’ have caused significant Oscar buzz. Mahershala Ali took home the award for best male supporting actor for his role in ‘Green Book’.